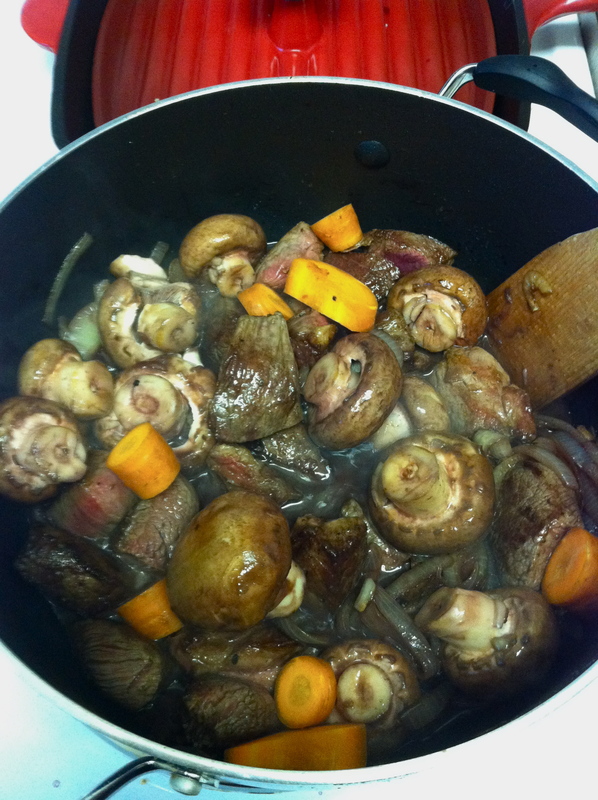 Beef and carrots and mushrooms, oh my! It seems that winter has at long last arrived to DC, unfortunately bringing with it a sudden 20 degree drop in temperature and winds that make my ears numb a minute after stepping out of the house. The good things about this are 1) Christmas, by far my favorite holiday, is almost here, 2) It’s time to switch to red wine drinking and 3) Cold weather begs for my favorite category of comfort food- stews, soups, and hearty pastas. A couple of weeks ago I wanted to make a pretty classic boeuf bourguignon (beef stew for you non-Europeans), so turned to the master of French cooking, Anthony Bourdain, for his recipe. I first read Bourdain’s Kitchen Confidential when I was about 13, which is arguably too young to be reading a book primarily about the not-so-PG goings on behind the scenes at restaurants. But I loved it immediately, have re-read it about 4 times, and encourage everyone to pick up a copy. Even if you don’t love food and backstage restaurant musings as much as I do, it’s a hilarious, witty read that everyone will enjoy. My parents, knowing of my love of this book, got me his Les Halles Cookbook one year, and it’s signed to boot, with a drawing of a knife and an inscription “To Roxana, Cooks Rule!”. This cookbook is basically everything one needs to know about classic French cooking, with tips, techniques, basic and not-so-basic recipes. I’ve loved French food (and wine) ever since the infamous consecutive summers my family spent hiking in the south of France, the first nick-named “The Summer of the Steak Frites”, and the second “The Summer of Duck”. If you ever need a funny story, ask my dad to tell you about the time the steak frites DID NOT COME WITH frites (Crazy, I know! Frites are fries, btw). The children of the group were not amused by this. My point of this is, French food is good. Seriously, those guys know their stuff. I would be happy eating boeuf bourguignon, mussels, rabbit, duck, pate, stinky cheeses and baguettes for the rest of my life. And now I have convinced myself that it has been far too long since our family has gone to France. This summer perhaps parents? I promise not to complain too much on the hikes through the Pyrenees. 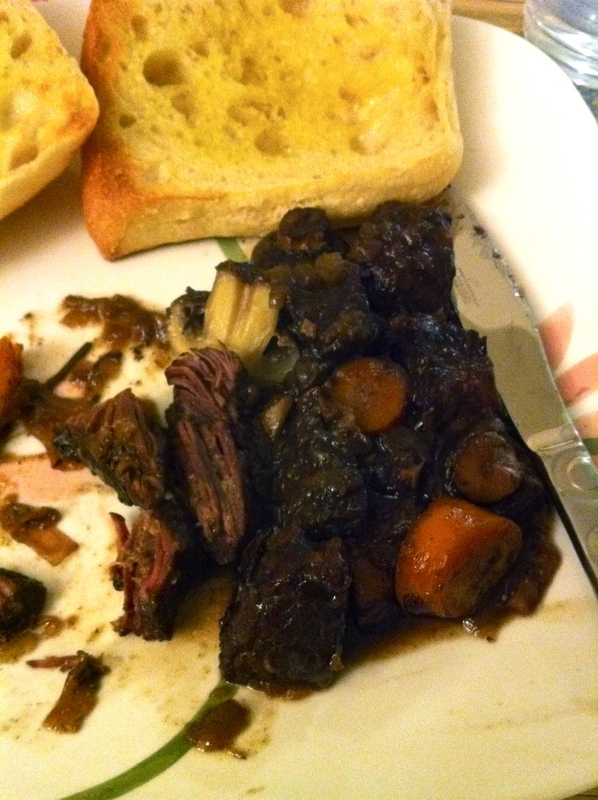 The recipe for boeuf bourguigon I ended up using was a combination of the classic Les Halles recipe and Pioneer Woman’s beef stew with mushrooms, as I wanted to experiment with mushrooms and make it a meal that didn’t need any additional vegetables. 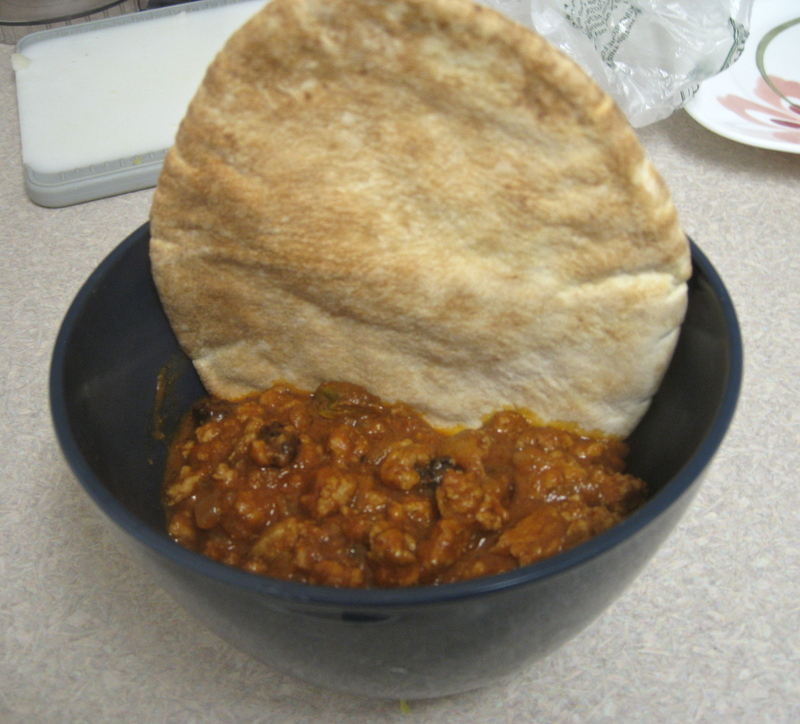 Don’t be intimidated by the ingredient list, this is really quite easy to make, it just requires some time as you leave it to reduce for a couple of hours. The best thing is, it gets even better overnight, so can easily be kept in the fridge (or frozen) to enjoy a few nights in a row. And if you’re planning a dinner party, this would be a fantastic and easy way to impress your guests. Look up the correct pronunciation of the dish and people will take you very seriously. Melt the butter and oil in the pot over high heat, add the meat in batches and sear on all sides until it is well browned. Make sure not to overcrowd the pot so the meat is well-seared. 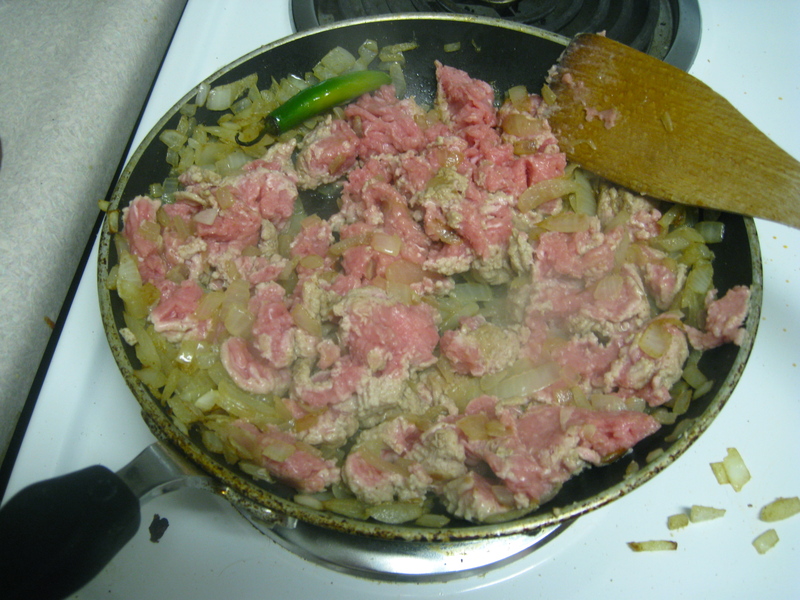 Remove meat to a plate and add the onions and minced garlic, sprinkle flour over them and cook over medium-high heat until they are soft and brown (about 10 minutes). 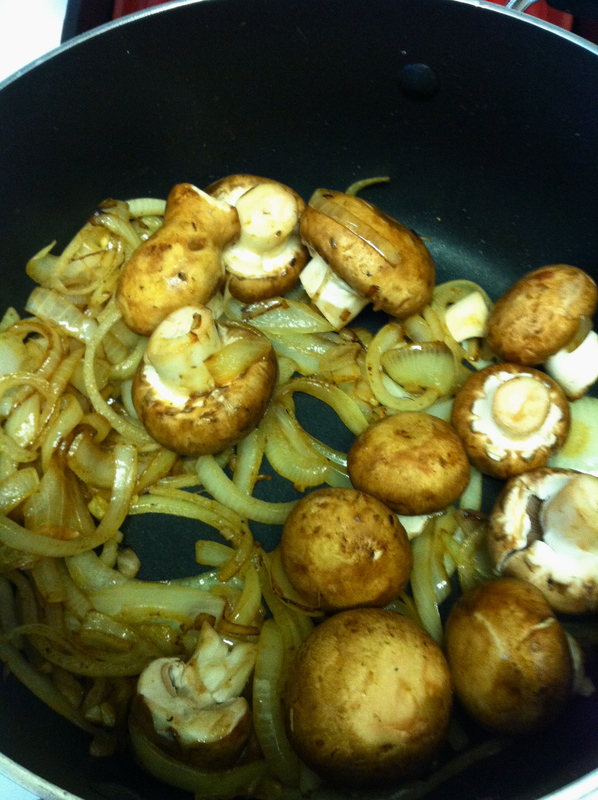 Add the mushrooms and cook for 4-5 minutes. Next add the red wine and scrape the pan to get all of the flavor from the bottom of the pan. Bring the wine to a boil. Return the meat to the pot and add the carrots and bouquet garni. Add enough water so the liquid covers the meat by one third (so 3 parts liquid to 2 parts meat). Bring to a boil, then reduce to a simmer, and let cook for about 2 hours, until the meat is very tender. You should stir the dish every 15 to 20 minutes, and skim off any foam the appears on the surface. When done, remove the bouquet garni, season with salt and pepper, and enjoy with warm bread, potatoes, or by itself.